"For three decades, Tim Ingold’s has been one of the most consistently exploratory and provocative voices in contemporary scholarship. This book leads us, in prose that is exactingly lucid and charged with poetic eloquence, on a journey through, amongst other things, Chinese calligraphy, line drawing, carpentry, kite flying, Australian Aboriginal painting, native Alaskan storytelling, web-spinning arachnids, the art of walking and, not least, the history of anthropology, none of which will ever look quite the same again! The work is at once a meditation on questions central to anthropology, art practice, human ecology and philosophy, a passionate rebuttal of reductionisms of all kinds, a celebration of creativity understood in the broadest possible sense and a humane and generous manual for living in a world of becoming." "Simultaneously intimate and all-encompassing, Tim Ingold’s second landmark collection of essays explains how it feels to craft an existence between earth and sky, among plants and animals, across childhood and old age. 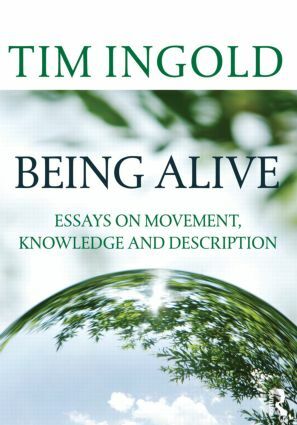 A master of the form, Ingold shows how aliveness is the essential resource for an affirmative philosophy of life." "In these iconoclastic essays, Ingold breaks the dichotomies of likeness and difference to show that anthropology’s subject, and with it that of the human sciences more generally, is not constituted by polarities like that of space contra place, but by a movement along paths that compose a being that is as alive to the sentient world as this world is to its human inhabitants." PROLOGUE. PART I: CLEARING THE GROUND. PART II: THE MESHWORK. PART III: EARTH AND SKY. PART IV: A STORIED WORLD. PART V: DRAWING MAKING WRITING. EPILOGUE.